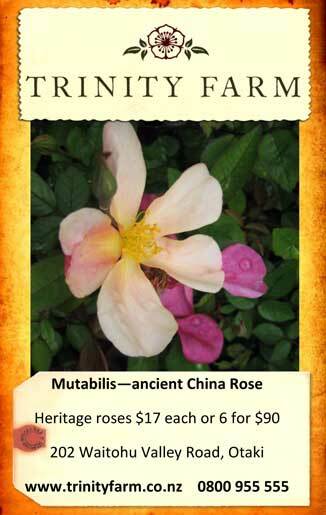 Mutabilis is a spectacular ancient shrub rose that flowers 10 months of the year with its 5 petal, single flowers that give the appearance of a swarm of butterflies alighting on the bush – hence its other name the Butterfly Bush. The flowers are unusual in that they darken as they age, opening buff, changing to pink and then red, followed by small red rose hips. Mutabilis can be grown stand alone as a large shrub, it also makes a stunning hedge or if unpruned will even climb at least a couple of metres. It is very easy to grow, putting up with poor soil and some shade. First introduced to horticulture in the early 1930s by a Swiss botanist, who obtained it from Italy, but believed to be a very old rose originating from China. This rose should be in the garden of every old villa in New Zealand, but it would be equally at home in a border or lining either side of a driveway as a hedge in more modern garden settings. The varied tones of the flowers make it versatile in blending into any landscaping plan and how many plants do you know that produce flowers for 10 months?